These stylish drop earrings feature a glittering amethyst, nestled in the twisted band of 9ct gold. Amethyst is the birthstone for February. 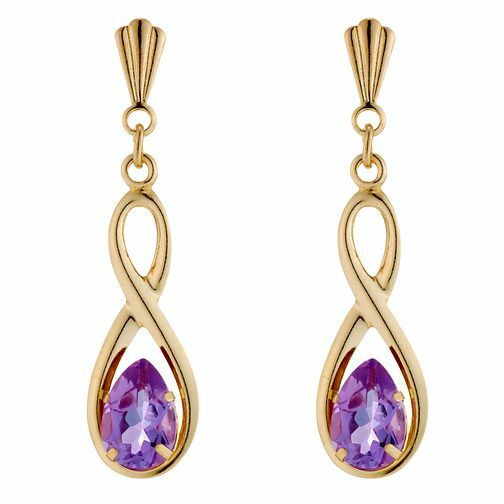 9ct Gold Amethyst ""Figure of 8"" Drop Earrings is rated 3.7 out of 5 by 6. Rated 4 out of 5 by Anonymous from pleasant design if a little smaller than I imagined Nothing wrong with these earings. Small and neat good for everyday. Rated 5 out of 5 by Anonymous from Beautiful piece of jewellery I bought this item for my mums birthday present to add a little something extra and she loved it.. Beautiful and dainty very lady like.. Stone set lovely in the gold figure of 8.. Exactly the quality you would expect from H Samuel.. The delivery was quick and within the allotted time too.. Thanks for making mums birthday that little bit more special..